Cigarette's aren't bad for you, in fact they make you happier, sexier, more popular and quite possibly richer. Not true? Then take a look at these vintage ads and see what the "Mad Men" of the time tried to get away with - and did. 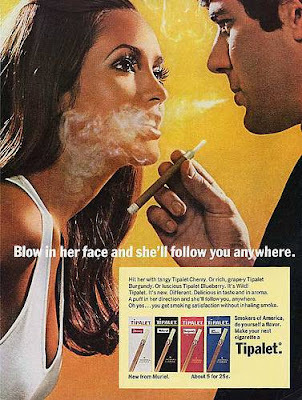 Before the days of ‘Fatal Attraction' and bunny boiling, men were encouraged to believe that women would succumb to the allure of the scent of a good cigarette. These were marketed here solely on the basis that if you blow the smoke in a woman's face she will become instantly besotted, strip off to her undergarments (OK might be an evening gown!) ad stare in to your eyes. However, even then it was a little past its sell by date as a marketing technique. Is the woman about to jump him or rip his head off? That look could mean anything! We all love the enduring classics but if you were to see a billboard today with a woman, blackened eye and smoking, you might just think it was an advert against domestic violence. Or, if the above should be taken literally, domestic violence in a lesbian partnership caused by a disagreement over which brand belongs in the house. The two lipstick lovelies look mighty smug. It can only be hoped they had health insurance (for the cigarettes and the constant battering they obviously received). The lesbian motif is surprisingly twenty-first century. The violence and the ciggies are not. Oh, baby! Despite the WTF expression on the baby's face, this advert would be banned in three, two, one, if any of those ‘Mad Men' chose to hoist it upon the public now. You and your baby son needed never to feel ‘over-smoked' with this particular brand. No, there's always an oxygen tent for the poor little mite, after all. 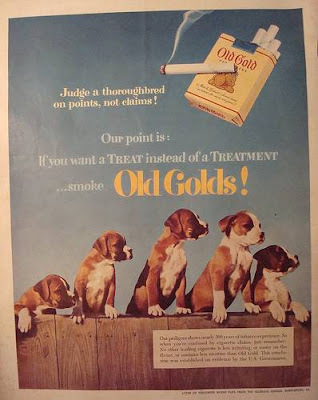 Most people are aware now that in the bad old days cigarettes were tested on dogs, and this was certainly no big secret way back then. It is surprising that even then the canine companion was the choice of mammal for this cigarette advertiser. It rather looks as if they may be escaping en masse from a laboratory where they have been cruelly experimented upon. One more jump, lads, and it's freedom! 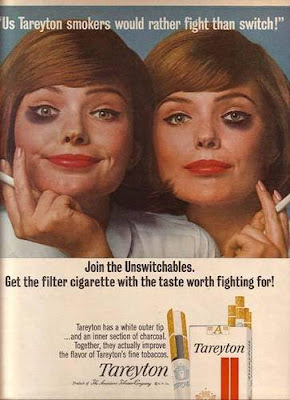 Of course the time came in the seventies when people knew that cigarettes were bad for you. 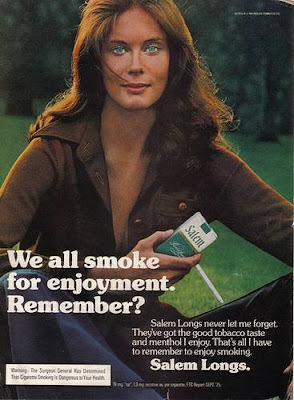 So, of course, the health warnings were plastered all over the adverts of beautiful people enjoying their ciggies, staring at you with apparent longing and showing that tempting piece of cleavage. There is an underlying message here too that smoking is sophisticated and goes hand in hand with an opulent lifestyle. As for the brand! Salem? We can only wonder what this lady's ‘lot' was to be. Pass the mask! And breathe slowly! 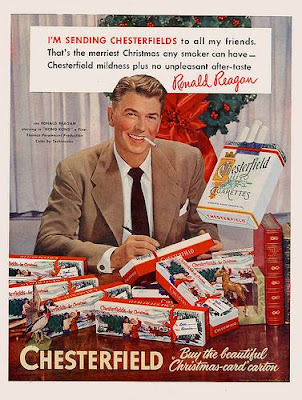 Way back in 1951, Ronald ‘Ronnie' Reagan was a struggling Hollywood actor and endorsing a brand of cigarettes was a way to line his pockets without feeling guilty about it, especially at Christmas time when, if we are to believe this, Mr. President-To-Be would gleefully send all his buddies out a large pack of cancer sticks. Naughty, naughty. Some prezzie from the Prezzie! Oh, but it gets worse! 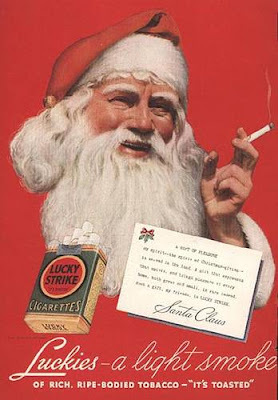 Not content with selling death at Christmas via the endorsement of B-listers, these guys just had to take the fun out of the festive season altogether by giving Santa Claus a strike and a light! Plus they made the present giver look like Will Geer out of The Waltons which is just unforgivable. No doubt the makers of this ad are on a spit somewhere in the depths for their wrong doing! One wonders if they debated whether to portray Jesus and the Disciples having a postprandial cigarette after a certain supper. The rotter's. 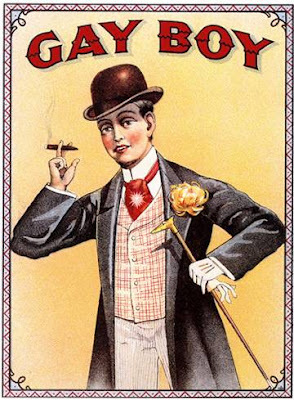 Back in 1890, Oscar may well have been at and people were going ‘wilde' for the brand above. However, certain words were yet to change their meaning and this ad might not get widespread approval these days, from any section of the community. On a lighter note, many Americans have been puzzled in to muteness (a strange and unusual thing!) when their British friends have exhorted that they are "dying for a fag"! Ah, two nations, one language, divisions. 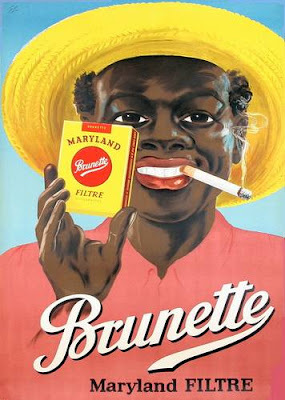 Less than sixty years ago, racial stereotyping was considered just fine and dandy for some cigarette manufacturers. One can argue that times - and attitudes -were different, but there is little or nothing that would attract the modern consumer to this caricature. Female emancipation and cigarettes? Well, yes, why not! 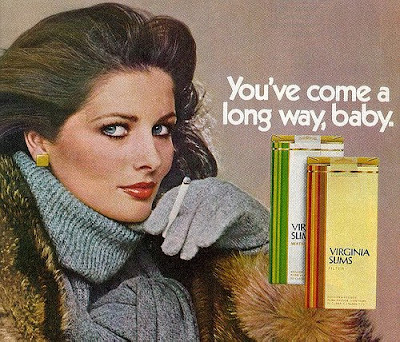 You've come a long way, baby, boasts this advertisement to the modern woman of the seventies. Strange how it still manages to get the patronizing ‘baby' in at the end. 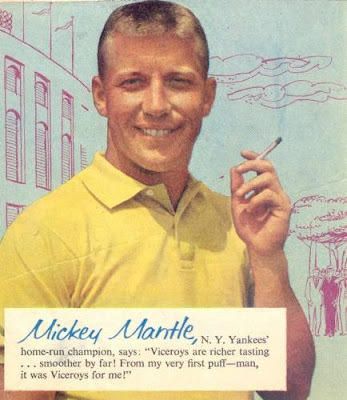 What better person to advertize cigarettes than an athlete! It is highly unlikely that you will get Michael Phelps advertising this particular product on a billboard near you soon! One for the road? 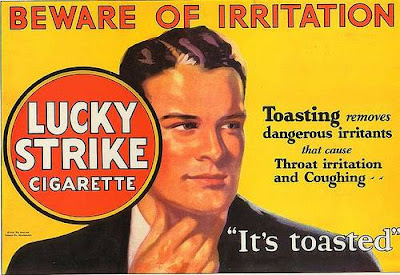 Yes, you had better switch cigarette, this advert implies, to one which will not irritate your throat. The less gullible consumers of today might well read in to this that the little tickle in this gentleman's throat is in fact lung cancer! Never to be seen again! Beautiful World on Bem Legaus blog roll!